Ghost Rider and Dare Devil happened to be two of my favourite comic book heroes over the likes of the more obvious mainstream ones. 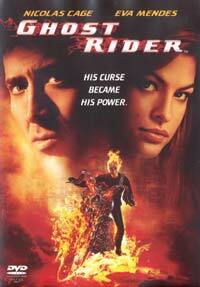 And as Dare Devil’s movie version was enjoyable but didn’t blow me away, so does Ghost Rider leave my flame fizzled. Had I seen this when I was about 14, it would’ve been a blast. But, as Cage would’ve been a bad pick as Superman, here he is a terrible casting choice as Johnny Blaze, the doomed biker. As a young man in a motorcycle daredevil carnival act with his dad, our hero inadvertently sells his soul to cure his terminally ill dad. 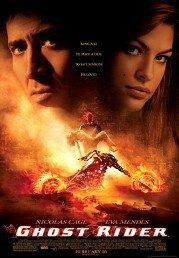 But Mephistopheles takes his father anyway as he’s fooled by a loophole in the contract. So he leaves his girl behind and goes on to become a very successful motorcycle stunt rider, his smashes and crashes defying death. Johnny is in fact not merely lucky, but protected by the dark side which has him lying in wait to transform into a flaming skeleton on an a mean infernal motorcycle to be used as an instrument against the evil Blackheart and his assorted cohorts rising in opposition. Cage has become a caricature of himself and female accessory Mendez looks particularly greasy (whether it’s the Southern weather, Johnny’s heat waves, her oily skin problem or the make-up artist giving her a misplaced overt glowing look). While there are some exciting sequences, the CGI is too blatant, aiding in dashing the legend some of us hold dear from our comic book youth. One cool touch is the fact that Peter Fonda (the original Easy Rider together with Dennis Hopper) plays Mephistopheles.